A mother and her three daughters were injured in a stabbing attack at a French resort by a Moroccan man who said they were “inappropriately dressed,” French authorities say. 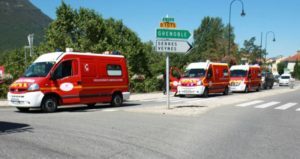 An eight-year-old girl was left fighting for her life after the attack in the Garde-Colombe in the Hautes-Alpes region of Southern France. The girl’s sisters, 12 and 14, and their 46-year-old mother were also injured. Jean-Marc Duprat, a deputy mayor for the town of Laragne-Monteglin, said the suspect, who is not related to the victims, was upset they were wearing shorts and t-shirts. French media said that the 37-year-old attacker fled by car but was caught and arrested. The man is believed to have attacked the three girls outside the family’s apartment before entering the building and attacking the mother.